– Adirondack Mountain Guides guarantees a friendly, welcoming smile, positive attitude and an experienced guide with thorough knowledge of the area. Ian is one of the most knowledgeable and motivated guides in the Adirondacks. Ian Osteyee is the first local guide to have an AMGA certification and has been climbing in the Adirondacks for 30 years. Ian began rock and ice climbing in the Adirondacks in the early eighties and began showing up on first ascents as early as 1984. Ian has climbed throughout the U.S. including Alaska, and has climbed in the Canadian Rockies, Europe, and even has several first ascents in Nepal. Ian is sponsored by Camp, Cassin, and Blue Water Ropes. Ian started guiding in the Adirondacks in 1986 and worked for various other guiding companies on and off as he travelled the world. 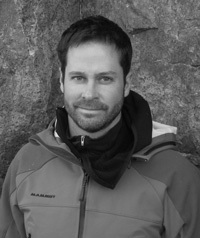 Ian then founded Adirondack Mountain Guides with the goal of fine-tuning rock and ice climbing instruction. Bigfoot Mountain Guides September rime ice!